Here at Book Arts, we honor all kinds of love! 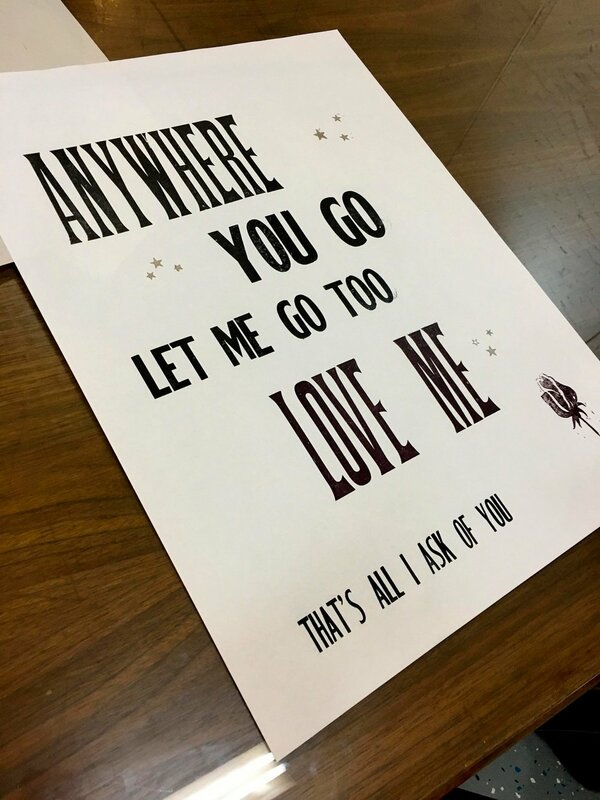 Use teamwork to create a souvenir of your friendship or relationship by printing a poster with the refrain of "your song," a favorite saying, an inspiring quotation, even a directive such as "pick up after yourself"! Anything goes at this fun, poster-making workshop; you can even come alone. No experience is necessary. Spend a fun evening in our shop, browsing our type and vintage illustration blocks to create two copies of a one-of-a-kind poster. Collaborate with a friend or loved one on a single design, or register alone and take away two copies of your poster yourself. Participants will learn to set type, help an instructor set a chase for insertion in a press, and print two copies of the poster they have designed. Ink on the posters may be wet, but participants will be able to take away their posters at the end of the evening.